Also Known As "KP" is one of Hawaiiʻs Funniest Emcee's, Comedians, Radio and Television Perosonalities. Kaleo Pilanca Entertainment was awarded the Star Advertisers #1 Hawaii's Best Wedding Emcee for 2015. 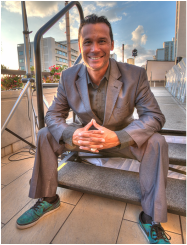 Kaleo is your night time guy with ISLAND 98.5 as an On-Air Radio Personality. Tune in Monday-Friday Nights 6 pm - 12 Midnight. Kaleo Pilanca compliments his fun spirit by mixing a blend of uplifting soundtracks and his unforgettably ‘kolohe’ behavior while utilizing people and props to bring his Go-For-Broke stories to life. Some people call him good-natured, unpredictable, clean with the on-the-edge quality. You never know what he's going to do or say next, and it is this that keeps his audience and his radio, emceeing, live show and television followers wanting more. He is the PRODUCER of his own a Stand-Up Comedy Show called "Laugh Up Hawaii Comedy Kanikapila"